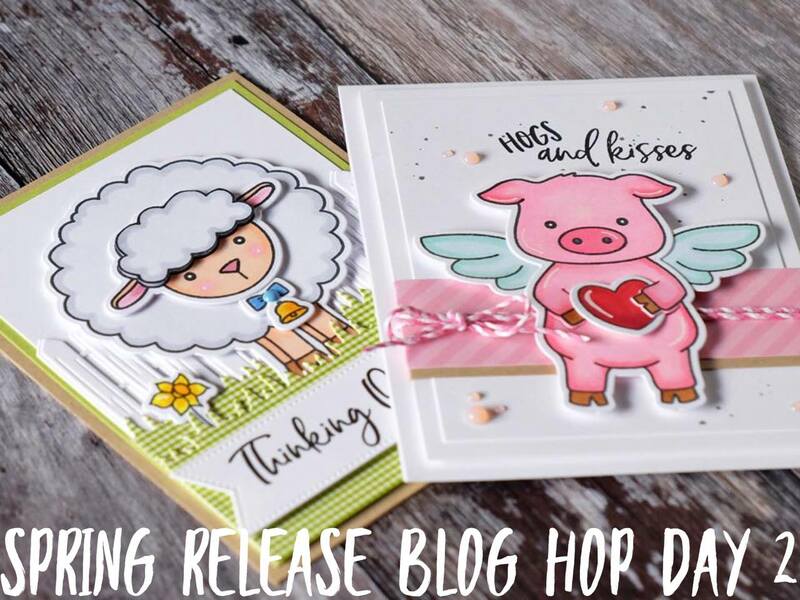 To celebrate the new release, we are having a two day blog hop. So please hop along with us both days to be inspired! Be sure to visit each blog & leave a comment to be entered to win!!! We will be giving away two $50 gift cards to the Honey Bee Stamps store, one from each day. The winners will be posted on our blog on May 5th on THIS link! Ob novi izdaji imamo pri Honey bee dva blog hopa, zato skoči z nami oba dni, da dobiš kar največ inspiracije. Ne pozabi obiskati vseh blogov in pustiti komentarjev, saj se tako poteguješ za vrednostni bon za v Honey bee trgovino v vrednosti 50$. Vsak dan bo podeljen en vrednostni bon, zmagovalca pa bosta znana 5 maja na TEJ povezavi! I really like the ladybug set and it's something I don't have in my stash. All of the cards you shared today are so so cute! Love the details you put on your cards from splatters to Nuvo drops to confetti. 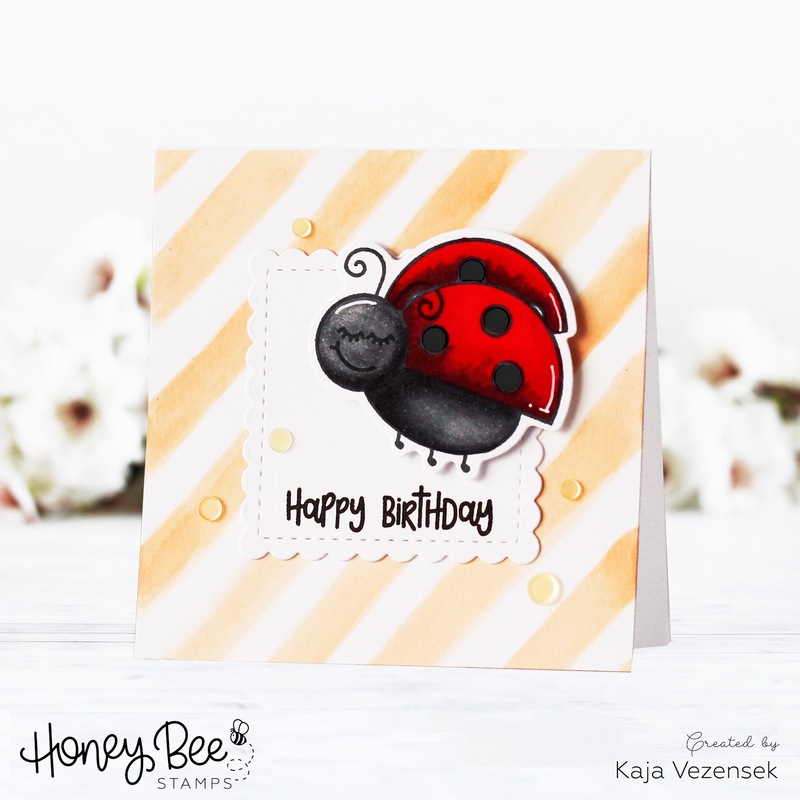 All of your cards are sweet and that ladybug is adorable! Lovely card ideas! Great release from Honey Bee... so many wonderful new sets! Beautiful variety of cards with these fun new products! Super cute, wish I could get them all. Like the flower card, but fell in love with the lafy bug. Too cute. That bunny is adorable but everything lady bug always steals my heart! Wow! Your cards are gorgeous!!! Adorable cards, I do believe I need the ladybugs! Nice cards. Love that one with the flowers. Krasne so, vse po vrsti. Tale release je res TOP. All your cards are so cute. I really like how you did the pjs on the bunny cards. Everything is just sooo cute! Love the pretty purple flowers, and the purple PJ's on the bunny. Sweet! Love all of your cards! The ladybug is just too, too cute! So many cards! Love all the cuteness! what a super adorable cards!!! Your cards are all so bright and cheerful! I love all the different backgrounds you have used to show off these sweet stamp sets. All of the cards are so cute! Thanks for sharing your creativity and talent with us! All of your cards are amazing! Love the Happy Birthday with the Lady Bug & the lamb card is another favorite of mine! Great job! All your cards are gorgeous Kaja! The coloring, the design.... LOVE! Cute cards and LOVE your colors! You make the sad bunny look cute! Terrific cards! I have fallen in love with those cute lady bugs! Darling! You did a wonderful job with the new release. Your cards are absolutely charming without being too cutesy. Love your backgrounds. My favorite is the ladybug with the "You brighten my day sentiment". Thank you for the inspiration. these are all so cute but oh that bunny with the plaid pjs! melts my heart! This is a wonderful range of cards that really make these new products shine. Love the cards, especially the bunny cards!! I love that stamp set since I'm a new Nana to a beautiful granddaughter!! Thanks for sharing your beautiful cards!! So many wonderful cards...great job! Your cards are adorable ! I love the bright and happy colors. The "little boy" is also really cute. Such cute cards! The ladybug cards are my favorite! So cool! I love how unique everyone's designs are! I am having a really hard time narrowing this release down to one or two favorites which might fit within the budget, and you just made it harder! So many wonderful examples! Thank you. (good thing I like rice and beans/....I might just decide to blow the grocery budget on stamps and dies (giggle!). Wow, lots of sweet cards. Oh my, such lovely cards! Thank you so much for sharing. I think your baby cards are my favorite! Lovely cards,..especially your welcome little boy & girl cards! All of your cards are super cute! Thank you for sharing. Goodness, you made so many cards! I love the baby cards, especially the little pacifier in his mouth. So cute. And your coloring of the flowers is, as always, lovely. Thanks for sharing all these great ideas with us! All of your cards are so cute! The baby cards are my favorite! The ladybug, lamb and bunny are all adorable! Pretty flowers too! Love all your cards! Adorable cards. I love the bunny in pajamas cards. They are darling. Thanks for sharing. That bunny and that ladybug!!! I think I need these sets! Beautiful cards! I love the pj bunny and cute little ladybug. Just adorable! Wow, all your cards are really cute! Čudovite vse po vrsti!!! Tale release je zelo uporaben!!! Those bunnies are just the cutest!! These are great cards & I'm in love with that lady bug. Very sweet and very lovely cards!!! WOW Kaja. What a great representation of the new products being release. Every single one of your cards are different and really show the amazing versatility of these stamp sets. Very well done on all of them! Adorable cards, thanks for sharing. Fantastic cards, love those pajamas! Precious cards! That pacifier gets me every time, so sweet!! Thanks for sharing so many wonderful cards. 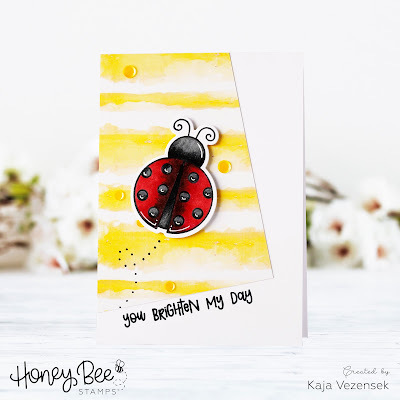 So many sweet cards, Kaja, well done! What an amazing release that is, right? Love so many of the products! Thanks for sharing your inspiration! So many fun cards - especially the baby cards! Adorable cards! Thank you for sharing. So many amazing cards! Gorgeous and elegant to cute and sweet - you've got all the bases covered. Beautiful coloring. All of your cards are adorable. Love your cards! So cute! Super cute cards. Great job! Your cards are great. I especially love your Lily the Lamb card. I like how you used the circle die to make a focal point. Such wonderful cards! The flowery one and the sheep really make me want those two dfferent stamp sets! lovely cards! the little bunny is one of y favorites but I really like the ladybug card too. Thank you for sharing your inspiration. those are so amazing cards! Wow !! All your cards are just so adorable !! Love that welcome baby girl card! So cute! Such fun and cute cards - love the ladybug and the bunny. These are all fabulous! Beautiful coloring! Fabulous cards. So much fun. TFS.